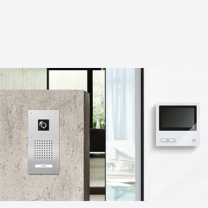 Intercom secures homes and buildings with the utmost of technological mastery and exceptional elegance. • Commercial and residential security systems featuring anti-burglary, card access, IP intercoms and closed circuit TV, providing secure video door IP intercom functions. • Building entry security systems with IP intercom, video and access control. • Home and commercial video IP intercom entry systems, video door answering systems, video door telephone for front door screening.